A hat tip to Kirk Taylor for pointing me to this collection of 1970s Japanese subway posters highlighting proper riding etiquette. It's relevant here primarily because Superman (slightly off-model) shows up several times. Re/code caught a series of Tweets from the CIA telling the real "Argo" story. Although not cited by name in this series, Jack Kirby's work is highlighted. 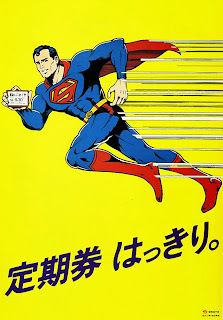 There's no link to either Kirk Taylor or the original Japanese subway poster post. On Business: Need to Keep Up!